"The Second Battle of Tippecanoe"
ambushed in a nearby ravine while searching for Indians who had beheaded a comrade. 18 soldiers were killed. Escape was gained by use of spurs to horses. the Carroll Co. line in Perry Township. The year succeeding the Battle of Tippecanoe, an expedition was sent out to complete the destruction of the Indian towns on the Wabash, Tippecanoe and Eel Rivers, and thus utilize the successes of the preceding campaigns by following them up and establishing their permanency. This expedition was under the command of General Hopkins, an officer of much experience in Indian warfare. Reaching the Prophet's town November 19, 1812, by the route which General Harrison had marked out, a detachment of 300 men, under the command of General Butler, was sent out to surprise the Winnebago town on Wildcat Creek, a mile from the Wabash. The place, which consisted of some forty houses and a number of temporary huts, they found completely evacuated. The Prophet's town, rebuilt and about the same size, and the corn crops in the vicinity, were then destroyed by our troops. 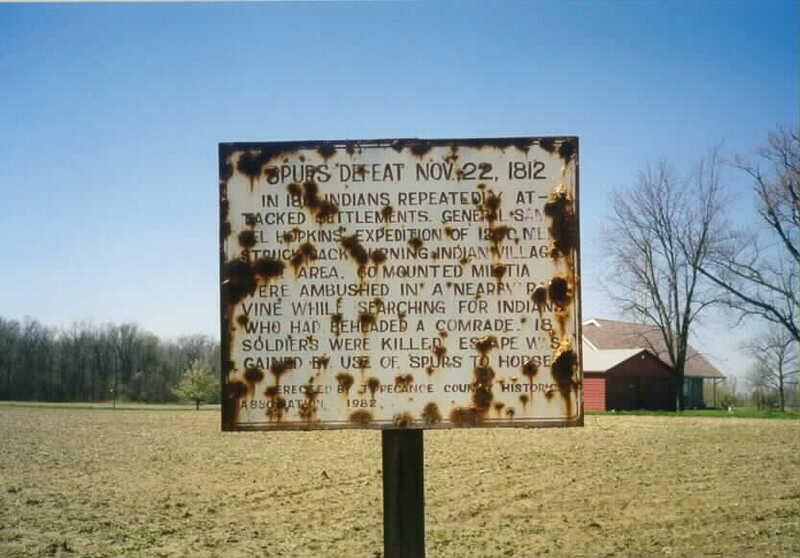 November 22, Lieutenant Colonels Miller and Wilcox, with about sixty horsemen, were led into an ambush on Wildcat Creek, about seven miles east of the Winnebago town, and were compelled to retreat in the most hasty manner. This has been known as "Spur's Defeat," probably alluding to the spurs which the men used so vigorously upon their horses. Source: Biographical Record and Portrait Album of Tippecanoe County, Indiana, 1888, pp. 217-218. So much has been written of the Battle of Tippecanoe and its importance because it disrupted the confederacy which Tecumseh was forming among the Indians for the purpose of retaining their lands, that there are few persons, even in this vicinity, who are aware that there was a second battle near Tippecanoe or The Prophet's Town in which the Indians were really the victors. Like the first battle it marked the climax of an expedition sent up the Wabash which included more men than accompanied General Harrison the year before. The expedition was like the first one too in that it included a man who afterwards became president of the United States. About the first of November 1812, General Samuel Hopkins began to organize a military force composed mainly of infantry for the purpose of penetrating the Indian country as far as The Prophet's Town, marching from Vincennes to Fort Harrison (Terre Haute), then up the river to The Prophet's Town, destroying the Indian villages along the river and any villages that they might find at or near The Prophet's Town. The troops which were employed in this exploration by General Hopkins consisted of three regiments of Kentucky militia, commanded by Colonels Barbour, Miller and Wilcox, a small company of regulars commanded by Captain Zachary Taylor (afterwards President of the United States), and a company of scouts or spies under command of Captain Washburn. Among the spies of Captain Washburn was Peter Weaver, who afterwards became one of the first settlers of Fountain County and the first settler of Tippecanoe County. This army started at once from Vincennes, arrived at Fort Harrison on the 5th day of November, and on the 11th of November left Fort Harrison following the road made by Governor Harrison's army the year previous. They reached the mouth of Sugar Creek on the 14th day of November. From there they moved slowly and reached The Prophet's Town on the 19th of November 1812. On the morning of the 19th three hundred men, under the command of General Butler, surrounded a Winnebago town about daybreak, but found it deserted. They found about 40 shacks and many temporary huts in the surrounding prairie. On the 20th, 21st, and 22d, this army completely destroyed The Prophet's Town, which had about 40 cabins and huts. Below it was a large Kickapoo village, on the west side of the river, consisting of about 100 cabins and huts. They also destroyed this town. Seven miles east of The Prophet's Town on Wild Cat Creek, a party of Indians fired on a detachment of this army, on the 21st day of November and killed a man by the name of Dunn. On the 22d of November about sixty men, under the command of Lieutenant Colonels Miller and Wilcox started on horseback to bury Dunn and get a more complete knowledge of the ground. They marched to a point near the Indian encampment, fell to an ambuscade and 19 of the party were reported killed, wounded and missing. Captain Little says, in speaking of this battle, "We rode on rapidly about a mile and a quarter when we found ourselves among and surrounded by Indians in hundreds, they fired on us in all directions as thick as hail. We immediately found that we were not able to fight them. I was shot in the body near the hip bone. We retreated in every kind of disorder the best way we could. I was still able to ride and got out to camp where we found that we had lost sixteen killed and three wounded." On the return of the party it was learned that a large assemblage of Indians, encouraged by their camp and this victory were waiting the approach of Hopkin's army, and this army at once made every preparation for an early march to engage the enemy in battle at any risk. There arose a violent storm with a heavy fall of snow and the coldest weather the these soldiers from the South had ever seen or felt at that season of the year. This delayed any further action until the 24th of November. When Hopkin's army reached the Indian camp they found it deserted, the Indians having crossed Wild Cat Creek. Mr. Hopkins says in his report, "I have no doubt that the ground the Indians have taken was the strongest I have ever seen. The deep, rapid creek was in their rear, running in a semi-circle and fronted by a bluff one hundred feet high, almost perpendicular, and could only be penetrated by three steep ravines. After reconnoitering sufficiently we returned to camp and found the ice so accumulated as to alarm us for the return of the boats. I had fully intended to have spent one more week in endeavoring to find the Indian camp but the shoeless, shirtless state of the troops now clad in the remnants of their summer dress, a river full of ice, the hills covered with snow, a rigid climate, and no certain point to which we could further direct our operations, under the influence and advice of every staff and field officer, orders were given and measures pursued for our return on the 25th." On the 18th day of December, 1812, General Samuel Hopkins announced, in general orders issued at Vincennes, his determination to retire from military life, and, while in his reports he commends all the officers, including Zachary Taylor, his resignation upon the return of the army to Vincennes is evidence that he did not consider it an expedition that had added any great amount of honor to the American arms. And this was the last of the battles that the fading red men of the forest had with the white men in the Wabash Valley. Source: Historical Sketches of the Wabash Valley by J. Wesley Whicker, 1916.